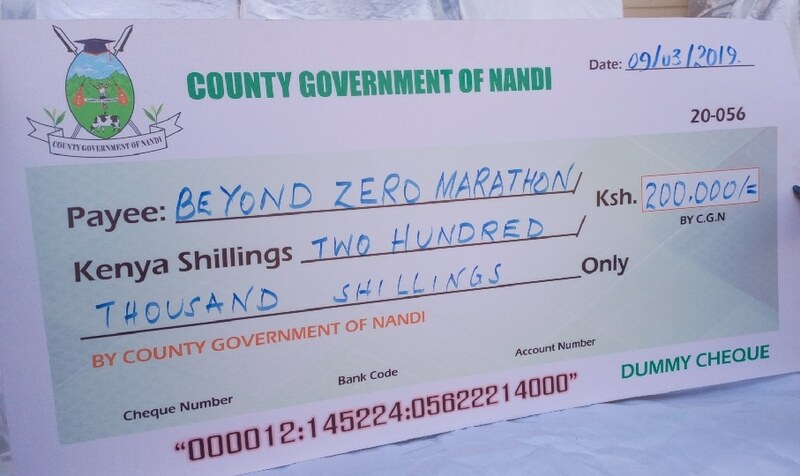 Beyond Zero Coordinator Angela Lang’at on Saturday at the Nyayo National Stadium Nairobi, received Kshs 200,000 from the County Government of Nandi in support of this year’s Beyond Zero Marathon. 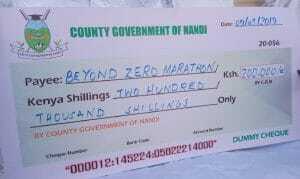 This year’s marathon will be held on Sunday at the Nyayo National Stadium, Nairobi County. 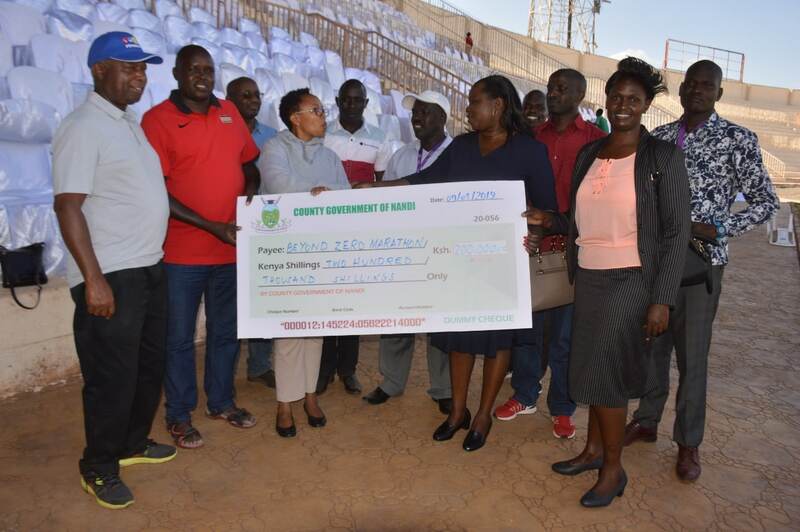 The cheque was handed over to the Beyond Zero team in the presence of Athletics Kenya President Lt. Gen. (Rtd) Jackson Tuwei by the County CEC for Health and Sanitation Ruth Koech together with the Chief Officer for Sports Kennedy Tanui and the Chief of Staff Priscilla Rono. While presenting the donation, the CEC for Health and Sanitation Ruth Koech commended the First Lady Margaret Kenyatta for her passionate effort and desire to make a difference in people’s lives. On her part, Angela Lang’at said the Beyond Zero healthcare initiatives have had a huge impact on health delivery to vulnerable populations especially in hard to reach parts of Kenya. “The Beyond Zero impact on the ground is truly amazing and you can see it,” said Angela. This year’s event is special, especially to people living with disability as they are fully catered for. The event will for the first time act as a Paralympics qualifier for the 2020 Tokyo Paralympic Games. 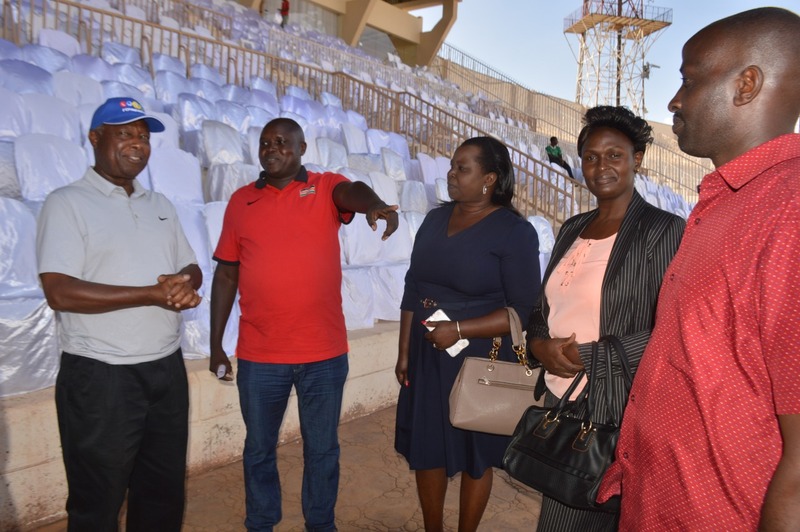 Through the Department of Sports, Youth Affairs and Arts, the County Government of Nandi sponsored 20 athletes for the event, noted Kennedy Tanui the Sports Chief Officer. Since inception in January 2014, Beyond Zero continues to play a key role in the elimination of preventable maternal and early childhood deaths as outlined in the Beyond Zero Campaign. The success of Beyond Zero is well demonstrated by the progressive improvement in key maternal health indicators as well as HIV prevention and management especially in Nandi County. There has also been an increase in stakeholder participation and goodwill, all necessary for a healthy population.